This chapter opens with a prophecy concerning the second coming. Here Christ’s clothing is stained red from crushing grapes during the grape harvest. These verses were fulfilled in A.D. 66-A.D. 74 during the Israel’s war with Rome which began during the grape harvest. All of Isaiah 63 was fulfilled to the letter in events leading up to and including this catastrophic war. During the second coming, Christ rides on the clouds at the head of an angelic army with his garments stained red with blood. 1 Who is this coming from Edom, from Bozrah, with his garments stained crimson? Who is this, robed in splendor, striding forward in the greatness of his strength? “It is I, proclaiming victory, mighty to save.” 2 Why are your garments red, like those of one treading the winepress? 3 “I have trodden the winepress alone; from the nations no one was with me. 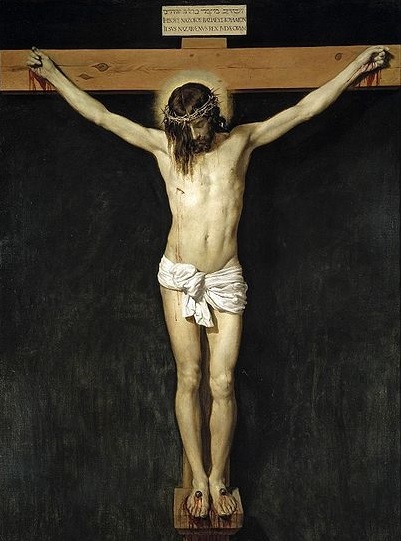 I trampled them in my anger and trod them down in my wrath; their blood spattered my garments, and I stained all my clothing. 4 It was for me the day of vengeance; the year for me to redeem had come. 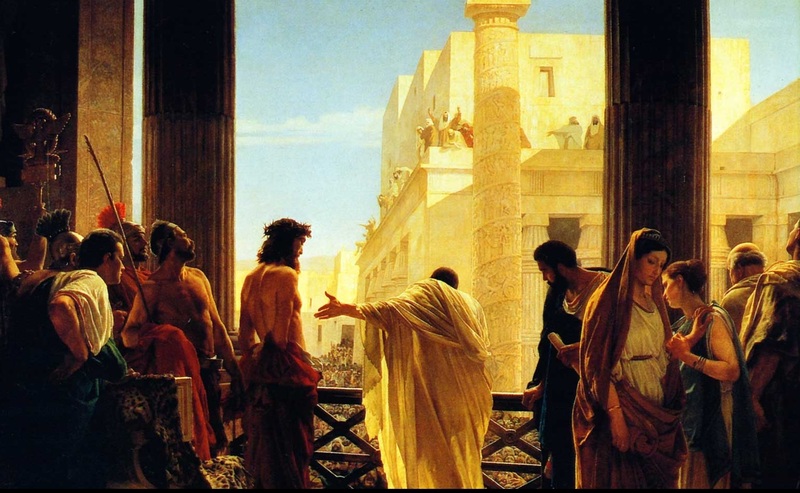 5 I looked, but there was no one to help, I was appalled that no one gave support; so my own arm achieved salvation for me, and my own wrath sustained me. 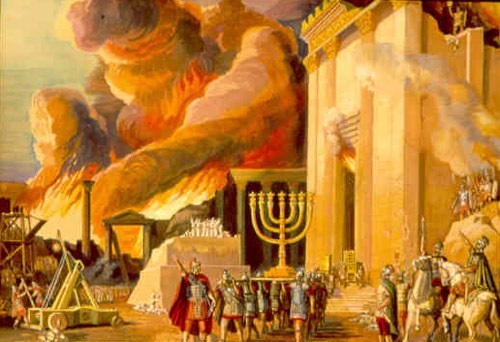 A Realized Eschatological View and Commentary of Isaiah 63: Isaiah 63 seems to have been initially Fulfilled in Judah’s War with Babylon in the Sixth Century B.C. However, the Final Chapters of Isaiah also appear to point to the End of the Age. Isaiah 63, like the other final chapters of Isaiah, appear to have been initially fulfilled in years and events following Judah’s war with Babylon in the sixth century B.C. which included the return of the Jews from exile and the rebuilding of Jerusalem. That having been said these chapters also appear to have been fulfilled at the end of the age. It is this latter fulfillment that is discussed here. A Covenant Eschatology Interpretation and Commentary of Isaiah 63:1-3:The Crushing of Grapes during the Grape Harvest is a Symbol of the Bloodshed of War. The War with Rome began during the Grape Harvest. In Matthew 13:39, Jesus says, “The harvest is the end of the age.” The Roman assault during the Jewish War began in A.D. 66 under Cestius on the month of Tishri–at the start of the grape harvest. According to Isaiah 63:1-5, Christ’s garments are stained with the blood of Israel. 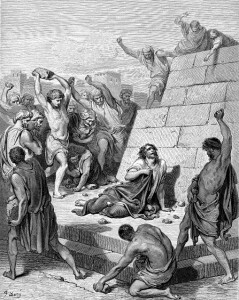 As is the case in Lamentations 1:15, the destruction of Israel depicted above is pictured as the crushing of grapes during the grape harvest with the resulting wine representing the blood of the people. The “A.D. 70 Doctrine” View, Interpretation, Exposition and Commentary of Isaiah 63:3:Jesus was seen in the Clouds at the Start of the Jewish War. 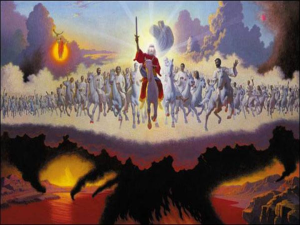 The event described above is addressed again in Revelation 19:11-15. 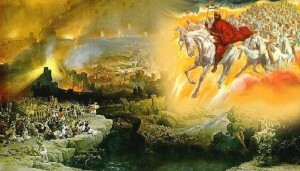 In these verses Jesus rides on a white horse with robes dipped in blood at the head of an angelic army. This army is dressed in clean, white linen. The fact that the robes of the heavenly host are clean and white while Jesus’ garments are stained with blood echoes v. 3: Christ alone treads the winepress. This vision of Christ leading a heavenly army in the clouds as is described in Revelation 19:11-15 was witnessed at the start of the Jewish revolt in Iyyar of A.D. 66: “[F]or, before sunsetting, chariots and troops of soldiers in their armor were seen running about among the clouds, and surrounding of cities.”1 This heavenly army in the clouds described by the Jewish historian Josephus in The Wars of the Jews is also recorded in The Histories by the pagan historian Tacitus: “In the sky appeared a vision of armies in conflict, of glittering armour.”2 The parallels between these two accounts and Revelation 19:11-15 are startling. For a detailed discussion of how this initial appearance of Christ during the second coming literally fulfills Biblical prophecy see Jesus, the Son of Man, was LITERALLY Seen in the Clouds in A.D. 66. 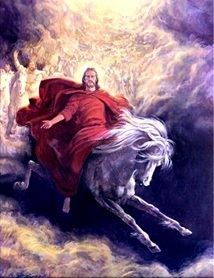 Also see Historical Evidence that Jesus, the Son of Man, was LITERALLY SEEN in the Clouds in the First Century for a detailed account of how this appearance of Christ in A.D. 66 together with the other appearances of Christ during and shortly after the Jewish War literally fulfill every detail of every verse concerning the second coming. The army in the clouds in A.D. 66. Notice the similarities between this historical event and Revelation 19’s description of the second coming. 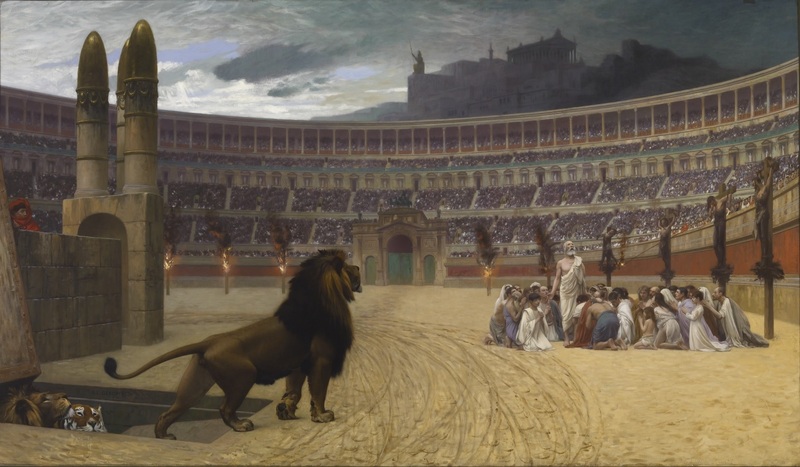 A Fulfilled Eschatology Interpretation and Commentary of Isaiah 63:6:Having killed Christ and His People in the First Century, both Israel and Rome were metaphorically Drunk with the Blood of the Saints. And as a result, Both Kingdoms were punished during the Jewish War. In Revelation 17:1-6 Jerusalem, the whore of Babylon, seems to share her cup of blood with her lover, the beast which is Rome. And as a result, Rome soon followed Jerusalem’s lead. In A.D. 64, the Nero Caesar tortured and executed a multitude of Christians. Both Israel and Rome had become metaphorically drunk with the blood of God’s people. And as a result, both cities were punished with the plagues of Revelation (see Revelation 17: A Preterist Commentary). 7 I will tell of the kindnesses of the Lord, the deeds for which he is to be praised, according to all the Lord has done for us—yes, the many good things he has done for Israel, according to his compassion and many kindnesses. 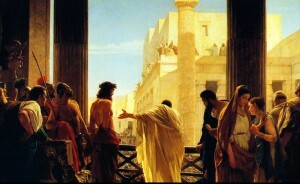 8 He said, “Surely they are my people, children who will be true to me”; and so he became their Savior. 9 In all their distress he too was distressed, and the angel of his presence saved them. In his love and mercy he redeemed them; he lifted them up and carried them all the days of old. 10 Yet they rebelled and grieved his Holy Spirit. So he turned and became their enemy and he himself fought against them. 11 Then his people recalled the days of old, the days of Moses and his people—where is he who brought them through the sea, with the shepherd of his flock? Where is he who set his Holy Spirit among them, 12 who sent his glorious arm of power to be at Moses’ right hand, who divided the waters before them, to gain for himself everlasting renown, 13 who led them through the depths? Like a horse in open country, they did not stumble; 14 like cattle that go down to the plain, they were given rest by the Spirit of the Lord. This is how you guided your people to make for yourself a glorious name. 15 Look down from heaven and see, from your lofty throne, holy and glorious. Where are your zeal and your might? Your tenderness and compassion are withheld from us. 16 But you are our Father, though Abraham does not know us or Israel acknowledge us; you, Lord, are our Father, our Redeemer from of old is your name. 17 Why, Lord, do you make us wander from your ways and harden our hearts so we do not revere you? Return for the sake of your servants, the tribes that are your inheritance. 18 For a little while your people possessed your holy place, but now our enemies have trampled down your sanctuary. In v. 10 God declares that He will become an enemy to Israel as a result of their rebellion against him. The crime for which they are punished will be addressed in the commentary on the following verse. The punishment is the Jewish War. 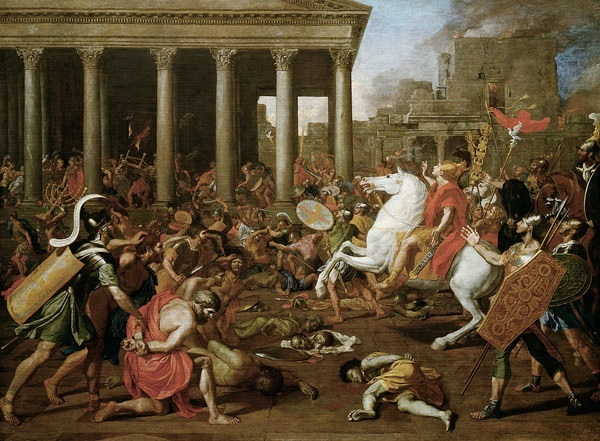 At the climax of this war, the Romans destroyed the Temple in fulfillment of v. 18. 19 We are yours from of old; but you have not ruled over them, they have not been called by your name. As indicated in the above Preterist commentary on Isaiah 63, all the predictions in this chapter seem to accurately describe events leading up to and including Israel’s war with Rome.